Most Canadians aren’t used to worrying about dangerously hot temperatures, but heat waves are becoming increasingly common. In 2009 over 150 people in British Columbia died due to a heat wave, and in 2010 more than 280 people died because of extreme heat in Quebec . Climate change means that heat risks will get worse, because global warming doesn’t just mean warmer average temperatures: it also means more intense heat extremes. We can expect to see more very hot days and nights, and heat waves are likely to become more frequent, more persistent, and more dangerous . These effects will be especially severe in our cities and towns, because they tend to be much warmer than the surrounding countryside. This is called the “urban heat island effect,” and it threatens over 30 million Canadians with much-increased heat risks, because over 4 out of 5 people in Canada live in urban settings . Luna Khirfan is an architect and professor of urban planning at the University of Waterloo; she notes that urban heat island effects are “a fact facing all cities” and have to be taken into account in how we plan, build and live in urban environments. The urban heat island effect happens because the closely packed buildings and paved surfaces that make up our cities amplify and trap heat far more effectively than natural ecosystems and rural areas, which are often shaded by trees and vegetation and cooled by evaporating moisture. In addition, cities also generate their own heat, which is released from sources such as furnaces, air conditioners, and vehicles. On a sunny day, paved surfaces can be a remarkable 27-50 °C hotter than the air . The difference is especially noticeable at night, when the heat captured by pavement and buildings during the day continues to warm the city after the sun goes down. Large cities can be as much as 12 °C warmer than their surrounding environments in the evening . 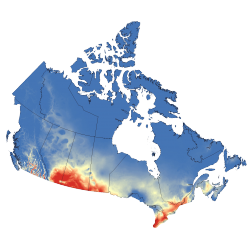 As the Climate Atlas shows, climate models project that Canada’s urban centres will see a dramatic increase in the annual number of extremely hot days due to continued global warming. Projections for 2051-2080 show that many Canadian cities will see at least four times as many +30°C days per year on average as they have in the past (assuming that global greenhouse gas emissions continue to rise rapidly). These numbers come from the Climate Atlas map of Very Hot Days. The Climate Atlas map of the average annual number of very hot days shows the dramatic increase in potentially dangerous temperatures that Canadians may face in the near future. Of particular concern is the fact that these climate model projections don’t actually take the urban heat island effect into account. Consequently, the number of dangerously hot days and nights in Canada’s cities will likely be even higher than our maps indicate. Read more: Why is heat dangerous? Prolonged exposure to high temperatures poses a direct threat to human health, with effects ranging from unpleasant heat exhaustion to the possibility of death from heat stroke. Increased heat also increases the risk of heart problems, including fatal heart attacks. A wide variety of people are especially vulnerable to these health risks. The elderly and the very young are both more likely to suffer from to heat-related illnesses, as are people living in poverty, people with chronic illness or physical disability, and people who work or are very active outdoors. In general, anyone who is unable to get relief from prolonged exposure to high heat, indoors or out, is at risk. Heat stress is only part of the health hazard posed by urban heat islands and made worse by climate warming. Higher temperatures also worsen issues related to air pollution and allergies. High temperatures increase the chemical reactions that convert vehicle exhaust into smog and ground-level ozone. Higher temperatures also lead to the production of more pollen and spores by fungi and plants . All of these factors can cause or worsen breathing problems, and have been estimated to cause as many as half of the health problems and deaths associated with heat waves worldwide . Dealing with extreme heat can be challenging. In Canada, the usual response is to rely on air conditioning. Unfortunately, spikes in the use of air conditioners during heat waves place a huge load on the electrical system, and can cause brownouts or blackouts that make the situation worse. And if the electricity that powers air conditioners is generated by high-carbon fossil fuels, then using them to deal with heat will worsen the global warming that created the heat in the first place. Many strategies promoting energy efficiency and cold-weather comfort are also excellent for dealing with high heat. For example, high-efficiency buildings that consume little power increase the capacity for the electrical system to cope with periods of high air-conditioning demand. Well-insulated buildings keep the heat out in the summer, just as they keep the cold out in the winter, increasing comfort and reducing the need for air conditioning in the first place. Luna Khirfan notes that buildings in many parts of the world are designed to deal with heat by “using the natural features of the ecosystem” and that urban planners and architects could help mitigate urban heat in Canada by paying more attention to passive cooling design elements, such as window placement and green roofs. To reduce illness and death from high heat events, cities will need to take large-scale measures that lower the vulnerability of high-risk citizens, especially the elderly, low-income families and the homeless. The City of Toronto, for instance, provides access to air-conditioned facilities during heat waves . Increased access to pools, splash pads, and drinking water can also offer city dwellers much needed relief. In Vancouver, Reimer notes that the city has a history of addressing cold-weather risks, but not the risks of heat: “[we] used to not have an extreme heat strategy. We had an extreme cold strategy to protect vulnerable people. We’ve now put in place an extreme hot weather strategy”. Some municipalities are also getting creative about addressing the factors that cause the urban heat island effect in the first place, by painting roofs and other surfaces in bright, reflective colours to reflect more of the sun’s rays, and creating and extending green spaces such as parks or urban forests and using natural systems for storm water management. Perhaps most importantly, we can head off the threat posed by very high temperatures by preventing global warming from getting worse. Taking steps to curb global climate change means we’ll have to deal with fewer heat-related problems in the future. See our Take Action section for stories and ideas about how Canadians can make meaningful change. Berry, P., Clarke, K., Fleury, M.D. and Parker, S. (2014): Human Health; in Canada in a Changing Climate: Sector Perspectives on Impacts and Adaptation, (ed.) F.J. Warren and D.S. Lemmen; Government of Canada, Ottawa, ON, p. 191-232. Wuebbles, D.J., D.R. Easterling, K. Hayhoe, T. Knutson, R.E. Kopp, J.P. Kossin, K.E. Kunkel, A.N. LeGrande, C. Mears, W.V. Sweet, P.C. Taylor, R.S. Vose, and M.F. Wehner, 2017: Our globally changing climate. In: Climate Science Special Report: Fourth National Climate Assessment, Volume I [Wuebbles, D.J., D.W. Fahey, K.A. Hibbard, D.J. Dokken, B.C. Stewart, and T.K. Maycock (eds.)]. U.S. Global Change Research Program, Washington, DC, USA, pp. 35-72, doi: 10.7930/J08S4N35.